This post is sponsored by JOANN. All opinions and ideas are our own. Now that the holiday decor is all put away I am ready to ring in the new year. 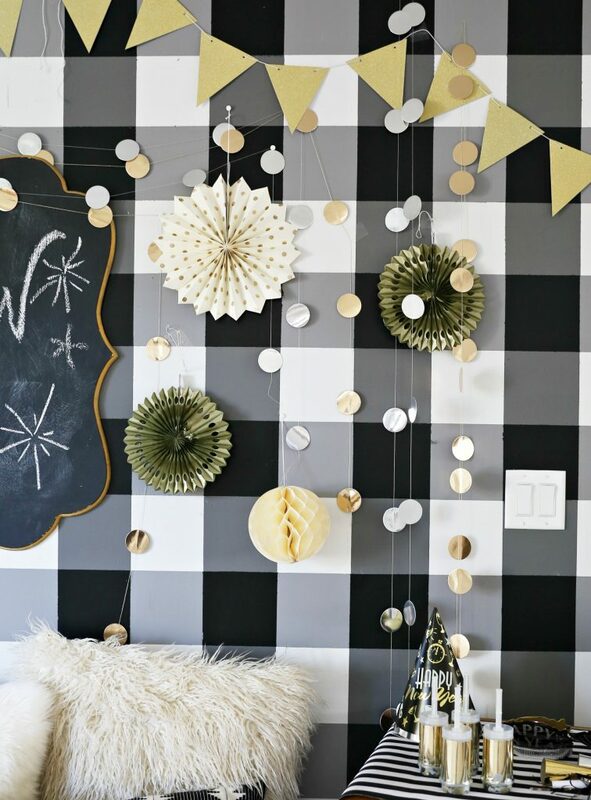 New Years is one of my favorite celebrations to decorate for. I love the traditional colors scheme of gold, black and silver. I also love all things glittery so it is one of my favorite holidays to go all out on. Knowing that I wanted to do the traditional colors scheme for the party I headed up to JOANN to see what decor I could find. 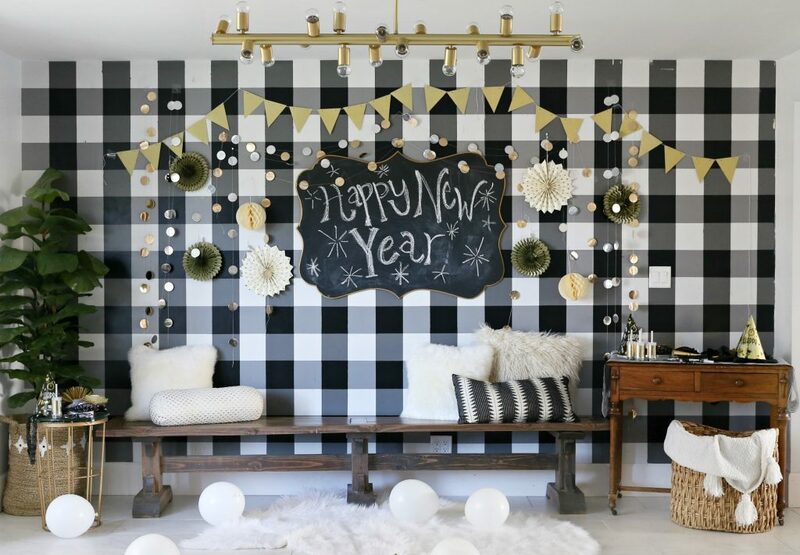 I found some amazing stuff and I really love how this years New Year’s eve party decorations turned out. When I went to JOANN I went straight to the wedding selection and I found some awesome gold, silver and black party decor. I found this 5 piece pack of glam assorted party decor, which came with the honeycomb, the pinwheels, and the glittery pennant banner. I found these shiny gold garland and silver circle garland from the Save the Date line at JOANN they were perfect for this party decor and I thought it looked like giant confetti. I also found these awesome glam silver, black and gold confetti poppers. 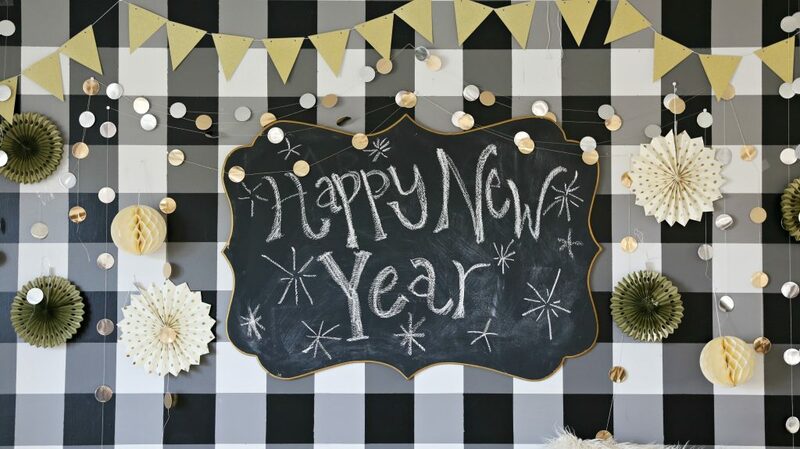 For the party accent wall I also used a chalkboard that I had made and I used white chalk to write Happy New Year. Everything was perfect for an awesome accent wall for the party and I thought it would also be a perfect picture sitting area. I always like to have some kind of statement wall in case people want to take a picture to remember the night. 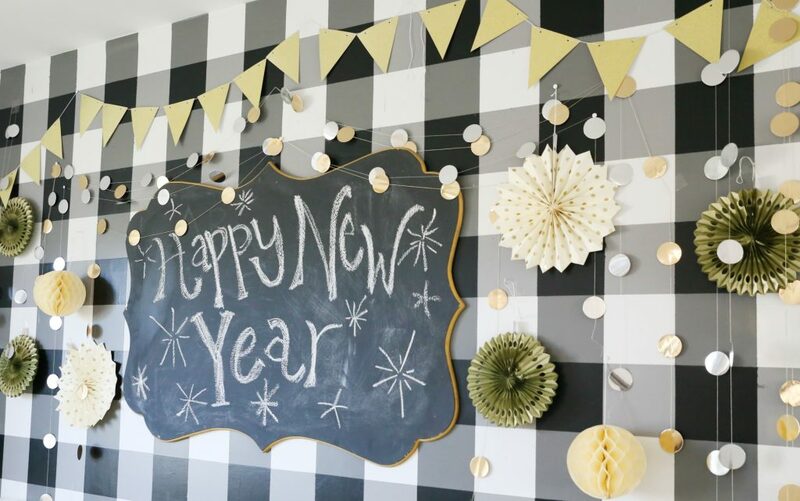 I loved everything I got at JOANN because it made it so easy for me to put together something awesome for New Years decor. 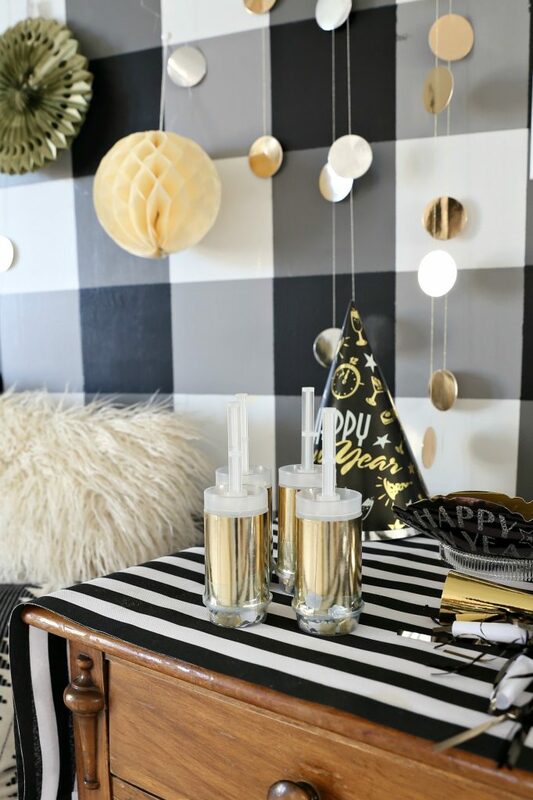 I loved that I was able to find some assorted party decor in one package and that it took all the guess work out and I was able to put together some awesome party decor with ease. I love this celebrating the New Year and I feel like it’s a chance for new beginnings and new goals. 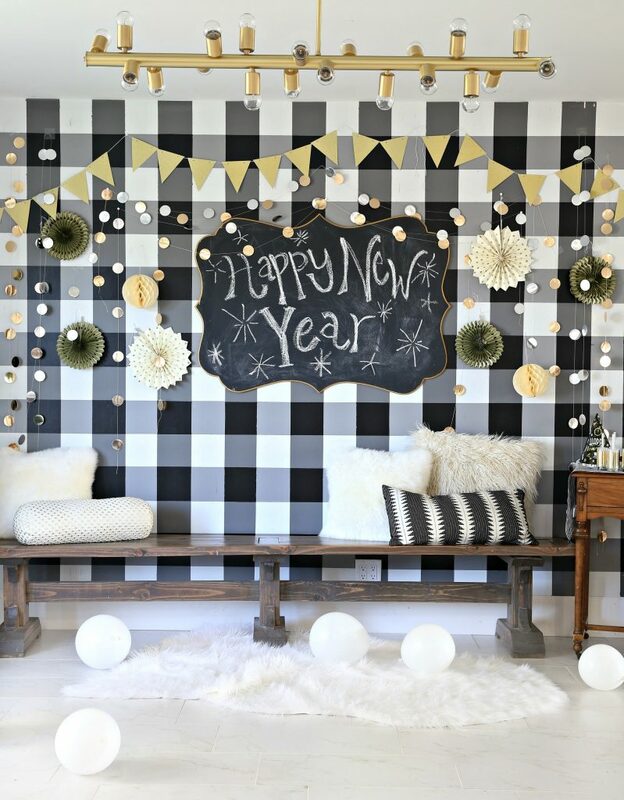 If you are planning on throwing a New Years party this year check out JOANN for some awesome and easy party decor. wow look so beauty and cute. Your idea is just fantastic and the decorations look awesome as well.I liked the color combination you have used.